LONDON--(BUSINESS WIRE)--Technavio’s latest market research report on the global powder injection molding market provides an analysis of the most important trends expected to impact the market outlook from 2018-2022. According to Technavio analysts, the global powder injection molding market will grow at a CAGR of close to 13% during the forecast period. Leading-edge process control and monitoring system for injection molding is a major factor driving the market’s growth. The injection molding industry stakeholders have been focusing on the development of an effective control system that will monitor and control the entire procedure in order to ensure increased efficiency and quality. In the global injection molding industry, Kistler Gruppe is a leading supplier of force, torque, dynamic pressure, and acceleration measurement technology solutions. The company unveiled ComoNeo in 2015, a process monitoring system, at the Fakuma trade fair. This product launch aimed to introduce an active monitoring and control equipment that will optimally monitor and examine the entire injection molding process, thereby leading towards cost reduction. Metal injection molding has been considered as the most suitable method for a wide variety of metals and alloys for several decades. However, when it comes to aluminum, the process has been considered unsuitable. With years of extensive R&D carried out, the researchers have developed a unique PIM technique for aluminum that can solve the previous issues and manufacture parts with complex shapes that are lightweight in an efficient manner. In sectors like automotive, aerospace, and space technology, this technology will be particularly interesting, where the weight of the final components is of utmost importance. “The raw metals used for metal injection molding are reactive to atmospheric oxygen, and hence, they are always coated with a layer of oxide. A typical metal injection molding process involves the mixing of powdered metal along with a binder to make it compatible to be used for the molding process. The semi-finished product, also known as a green part, is then introduced into a sintering furnace for heating. The heat aids in removing the binding substance while further heating aids in eliminating the oxide layer. The metal grains then come in direct contact with each other and finally join to produce the final solid metal component,” says a senior analyst at Technavio for research on engineering tools. 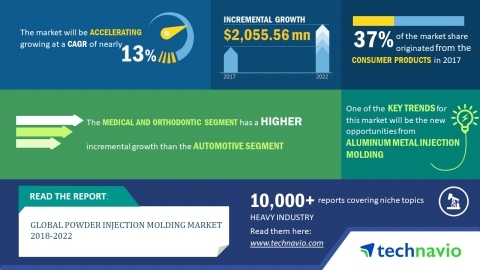 This market research report segments the global powder injection molding market into the following end users, including consumer products, medical and orthodontic, automotive, and aerospace and defense and key regions, including the Americas, APAC, and EMEA. The consumer products segment held the largest market share in 2017, accounting for nearly 37% of the market. The market share for this end user is expected to increase by 2022. The fastest growing end user is aerospace and defense, which will account for nearly 18% of the total market share by 2022. APAC was the leading region for the global powder injection molding market in 2017, accounting for a market share of nearly 40%. By 2022, APAC is expected to continue dominating the market and register the highest growth rate of nearly 3%. According to Technavio analysts, the global powder injection molding market will grow at a CAGR of close to 13% during the period 2018-2022.